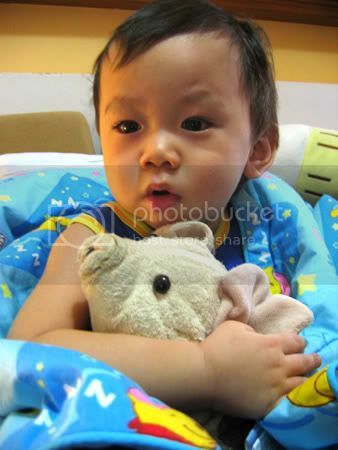 sick.. - A mummy's inane blabberings..
My li' boy is ill...he was diagnosed him with bronchitis. Actually, he fell sick on my very first day of work and his first day of playschool. It was fairly mild then..just some runny nose and we thought it would blow over pretty soon after he had taken his meds regularly. He did recover a li' and we let him go back to school by the end of the week. But I made a mistake of letting him go swimming during the weekend [yah..stupid mommy lah *sigh*] and he started to cough during the start of the 2nd week. Went to the doctor and he was given some cough meds and new runny nose meds...By mid-week, the symptoms seemed to have lessened so he went back to school again but yesterday, he seemed to get worse. He started coughing more than usual and puked while having his dinner. Mom-in-law brought him to the doctor again this morning and doctor said it was bronchitis and he was given more meds including antibiotics...and we were told to bring him back next Monday so that she can see whether the meds are working. One of my colleague who is a mother of 3 suggested that I try TCM..Don't know how to pronounce it but she helped me write it down (in chinese of coz). She said that it worked really well for her sons. Any one tried it on their kid before? Thankfully, for a sick child, Aidan is neither cranky nor did he have problems sleeping thru the night..even though his nose was blocked and he was wheezing quite a bit. He was still very active and jovial..leaving a trail of mucos everywhere~! Hopefully, he'll get better soon. I know that by exposing him to so many kids in the playschool means that it'll increase the chances of falling ill..But I didn't expect him to get sick so fast. I may wait a while longer before letting him return to playschool..Just want to make sure he totally recovers. The principal of the school was really nice too. She told me that she'll make sure I'll get some of this month's school fees refunded. She even came over to visit the li' one and brought a li' gift for him. I thought it was really sweet and thoughtful of her. I gotta admit..I can't help feeling guilty. I can't be around to care for & manja him when he's ill. I'd seen him through all his 'sick moments' during the past 18 months ..but now...*sigh* I'm really grateful to my in-laws for being there for him and that my new maid Nenita has been a great help too. Aidan is getting with comfy with her now and sometimes, when i come back from work, I see the both of them playing together and him laughing away happily. But the minute he sees me, he'll drop all the toys he's holding on to and start running towards me..That's always such a great feeling..to see my li' child wanting me. Teary eyes, ruddy nose and looking a li' mabok after taking his meds..
oh no..hope u get better too! Man..everyone's falling ill..both adults & kids! Bad man..
drinking orange juice or eating Vit C helps to build up the immune system. :) I'm still eating them. haha. Poor lil Aidan. He looks sick from the pix but its good to hear that he is still active. Hope he get well asap. Btw, saw your last post pix @ Anny's plc. You really look great and slim down. not really as slim as i hope to (im still 53/4kg :P) hoping to be abt 50kg at least hehe..but thanks! thanks dear..he is getting better now!!! eh not really..especially if the kid is just starting out at playschool. Immune system not 'equipped' with so much germs ard..I should have gave him tons of vits to prepare him before he started school. In a long run, yes, it could be better coz his immune system would have 'strengthened' then..
Poor boy. Hope he gets well soon. oi..no monkey updates for so long? hope aidan gets well soon!! Aww, poor Aidan. Kids do tend to fall sick more easily once they start going to school. Ally hasn't caught any other bug since she stopped going to hers. Hope he gets well soon! And don't feel guilty. We all do the best we can, given the circumstances we are in. That's a cute pic :) What occasion is that for? The launch? Did Ally get sick at childcare too? 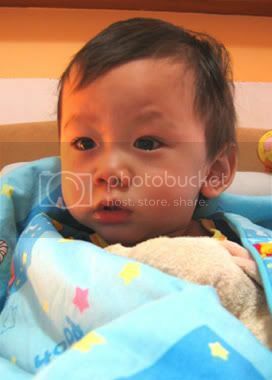 hope he recover soon & let mummy go back 2 work in peace ya..
Awww, he still looks like such a cutie even though he's sick. Maybe it was a good thing that we missed you after all. ;) Hope Aidan feels better real soon!! Yeah..it's really great eh..when you see your kid's face light up and start running towards u with arms stretched out when they see you..That's really what I look forward to when I come back from work everyday! Don't feel bad, Aidan is in GOOD HANDS with ILS and Nenita. hey..wanna join us for dinner this friday or mebbe saturday? Just chabors only can? but he looks so darling even when he is sick. But get well soon, Aidan!